If a tree falls in the city, who will get the blame? 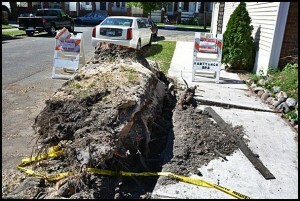 A large tree that fell on Botsford St. has set off a debate on the city’s tree removal policy. Three years ago Lawrence Smith warned city officials about the big tree in front of his house on Botsford, near Fleming. The tree had been leaning at a dangerous angle, giving many the impression it was about to topple over. “We knew the tree was going to fall,” Smith said. Sure enough, it did a week ago Friday during a wind storm. It fell forward, the way it was leaning, and crushed the roof of a parked car and slammed into the house across the street. The tree has now become a lightening rod of finger-pointing over who was at fault. Emergency Manager Cathy Square said Steve Shaya, the Director of Public Works, should have included it on a list of dangerous trees that needed to come down. “It’s his job to maintain a dangerous tree list,” she said. But the tree had been marked for removal in last June’s sidewalk repair program. That’s when a number of trees were removed suddenly over a weekend, which in turn drew public outrage. Acting City Manager Kyle Tertzag, who was let go by Square two weeks ago, reversed the tree removal plan and ordered that instead of cutting down the trees, the roots causing sidewalk slabs to buckle would be cut out. That was the case of this tree on Botsford, but some question the wisdom in doing that because it was feared the tree would be left unsecured. The tree’s base was left exposed when it fell over, and it appears the remaining roots ran very shallow for a tree that size. When Emergency Manager Square started work on July 1, she put a halt to the sidewalk repair program. City Councilmember Cathie Gordon faults Tertzag for allowing the cement contractor to cut off the tree roots instead of having an arborist continue to do the work. But Square seems to be blaming Shaya for not having taken care of the tree before. “Was a tree at a 60-degree angle going to fall down anyway in a big wind? Yes,” she said.